325 pages, 8.5" x 11"
In 1975, the Boston Red Sox played in what was the most-watched World Series in history, an epic seven-game battle with Cincinnati's Big Red Machine that captivated the nation's attention and revived baseball's lagging popularity. '75 tells the life stories of the 37 players who made up the Red Sox roster, from stars like Yaz, Fisk, and El Tiante, to the mop-up men and bench-warmers who were along for the ride. Some 48 authors, researchers, editors, fact-checkers, and baseball enthusiasts from the Society for American Baseball Research (SABR) have collaborated to present their work in the volume. Drawing on many exclusive interviews with players and the archives of the National Baseball Hall of Fame, '75 contains many stories not previously told and offers new details on the lives of these players who inspired so many in their time. This 2015 edition offers numerous items not contained in the original 2005 publication — full biographies of all of the coaches, the broadcast team, and owner Tom Yawkey — 10 new biographies. We have also added six game accounts (linking to SABR's Games Project, these are games written specifically for this book), as well as an essay on the ALCS, an essay on the World Series, and a "By the Numbers" piece. That makes a total of 19 new items — 10 bios, six game accounts, and three other items — in this edition. '75 remains a unique treasure for anyone who remembers Carlton Fisk waving his arms in the October night. Contributors include: Ron Anderson, Mark Armour, Jonathan Arnold, Eric Aron, Ray Birch, Andrew Blume, Maurice Bouchard, Bob Brady, John Cizik, Clem Comly, John Contois, Herb Crehan, Jon Daly, Bob Donaldson, Alex Edelman, Greg Erion, Dan Fields, James Forr, Peter M. Gordon, Tom Harkins, Joanne Hulbert, Bob Hurte, Seamus Kearney, Bob LeMoine, Len Levin, R.R. Marshal, Les Masterson, Wayne McElreavy, Chuck McGill, Max Miller, Tom Nahigian, Bill Nowlin, Mark Pattison, Jim Prime, Mike Richard, Carl Riechers, Doug Skipper, Curt Smith, Matthew Silverman, David C. Southwick, Mark S. Sternman, Brian Stevens, Wayne Strumpfer, Cecilia M. Tan, John Vorperian, Nick Waddell, Dave Williams, and Gregory H. Wolf. E-book: Click here to download the e-book version of '75: The Red Sox Team that Saved Baseball for FREE from the SABR Store. Available in PDF, Kindle/MOBI and EPUB formats. 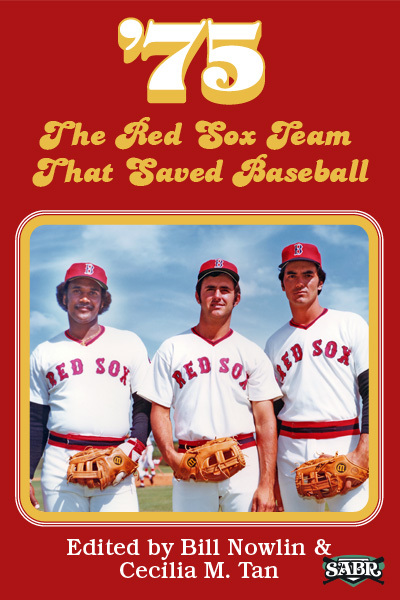 Paperback: Get a 50% discount on the '75: The Red Sox Team that Saved Baseball paperback edition from the SABR Store ($15.99 includes shipping/tax). E-book: Click here to purchase the e-book version of '75: The Red Sox Team that Saved Baseball for $9.99 from the SABR Store. Available in PDF, Kindle/MOBI and EPUB formats. Paperback: Get the paperback edition of '75: The Red Sox Team that Saved Baseball from the SABR Store ($30.99 includes shipping/tax). For 40 years, SABR and its members have led the way in publishing the best baseball historical and statistical research. Our publications program is shifting to take advantage of new methods of publishing. Not only will we continue to publish new books like Can He Play? A Look At Baseball Scouts and Their Profession (released in December 2011); Opening Fenway Park in Style: The 1912 World Champion Red Sox (May 2012); Detroit Tigers 1984: What A Start! What A Finish! (December 2012); Sweet '60: The 1960 Pittsburgh Pirates (April 2013); Inventing Baseball: The 100 Greatest Games of the 19th Century (July 2013); Thar's Joy in Braveland: The 1957 Milwaukee Braves (May 2014); Detroit the Unconquerable: The 1935 Detroit Tigers (December 2014); and Winning on the North Side: The 1929 Chicago Cubs (February 2015), which showcase the best efforts of SABR's members, chapters and committees, but new technology makes it possible for us to bring out-of-print titles like RUN, RABBIT, RUN: The Hilarious and Mostly True Tales of Rabbit Maranville (February 2012), GREAT HITTING PITCHERS (March 2012), NINETEENTH CENTURY STARS (August 2012); Batting (January 2013) and The Fenway Project (September 2013) back again. This page was last updated October 31, 2017 at 7:31 pm MST.